So What Changed? Why on the table now? Last month Sudam was one of the people who were released in the exchange of hostages that happened between commander General Ali Mohsen Al-Ahmar and the military of president Ali Abdulla Saleh. News of the release became the talk of the street when it was announced that the person released was indeed a journalist and not a soldier. Al Ahmar ‘s side stated that they captured him because he was the personal translator not knowing he was a journalist. As people in Yemen were not shocked, people who lived outside Yemen saw something abnormal. Hind Hussein also known on twitter as @Dory_Eryani picked this up and with friends launched a twitter campaign and Facebook page, to put pressure on Reuters. Reuters began its respond by denying, and going round the bush. But things changed after The New York Times, and The Washington Post commented on this issue. In addition to the great idea and effort done by Hind Hussein, blogs by the influential Guardian’s Brian Whitaker, and well recognized Sultan Al Qassimi and famous journalist blogger Dima Khateeb helped spread the word Big & Fast! 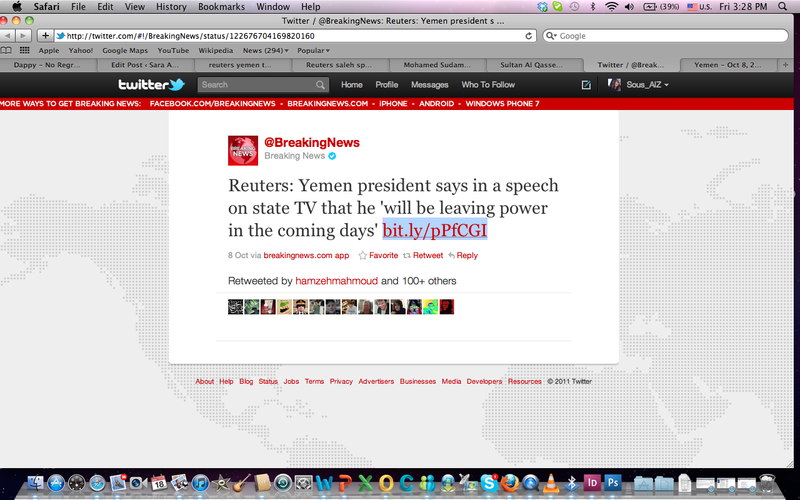 Reuters credibility on the line? As Reauters is considered one of the most trusted news sources, overlooking Sudam’s dual situation was clearly a mistake. Looking back at the news related to Yemen, one notices that their news mostly evolved around the President willing to step down “which hasn’t happened yet” and overlooking bigger issues such as fierce attacks on the opposition. The irony of the matter that “the translator” did not translate the Arabic Speech to English properly. This entry was posted in Twitter, Yemen by sousalz. Bookmark the permalink.